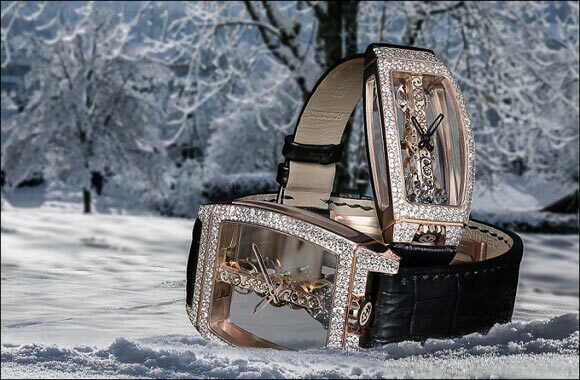 Dubai, UAE, December 19, 2018: Christmas is in the air: just in time for the festive season, Corum is releasing two new versions of its Golden Bridge with a new “snow” setting. Made exclusively of diamonds, the snow setting involves arranging a random number of diamonds of all sizes in such a way that together, they cover up the entirety of the metal. It is a high-level jewellery practice for two reasons. Next, there is the setting itself. As each diamond has a unique size, so too must each claw used for setting. It is a task requiring extreme precision which prevents the setting from being standardized, as each claw is individually worked to set its diamond and it alone. Each piece will be released in white gold and pink gold, meaning there are four models in total, for a total of 314 diamonds for the Golden Bridge and 245 diamonds for the Miss Golden Bridge, representing 2.68ct and 1.28ct respectively.